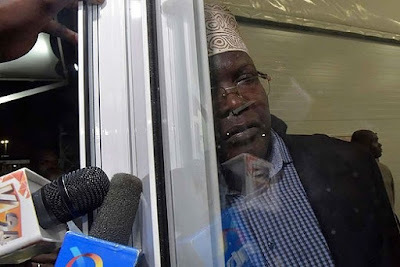 Home / News, Other Political News, Politics / MIGUNA MIGUNA reveals how GSU officers treated RAILA ODINGA at JKIA - He was humiliated and almost beaten! MIGUNA MIGUNA reveals how GSU officers treated RAILA ODINGA at JKIA - He was humiliated and almost beaten! Wednesday August 1, 2018 - Self proclaimed National Resistance Movement (NRM) general, Miguna Miguna, has revealed how NASA leader, Raila Odinga, was humiliated by General Service Unit (GSU) officers when he went to Jomo Kenyatta International Airport (JKIA) to beg immigration to allow ( Miguna) back into the country. In heavily worded statement on Wednesday, Miguna who was deported to Canada for participating in the illegal swearing in of Raila Odinga as the People’s President on January 30th revealed that Raila Odinga was embarrassed by GSU officers at the airport despite his handshake with President Uhuru Kenyatta. Miguna made this remark after Raila Odinga told Citizen TV that Miguna Miguna is an ungrateful person who has no respect for those who made him. “If Raila Odinga is genuine and if his claim that he is Uhuru Kenyatta's "brother" is to be believed, why was he being pushed around by junior police constables at the JKIA as a Makanga on March 26th? Or was that just another pathetic fake PR stunt?” Miguna stated. He also urged Raila Odinga to stop mumbling on TV when supporting his illegal deportation to Canada in February. “Raila Odinga, do you support torture and sedation of political opponents? Speak up. Stop mumbling,” Miguna said.